More and more people like to do more with their kettle grills than just grilling and smoking. 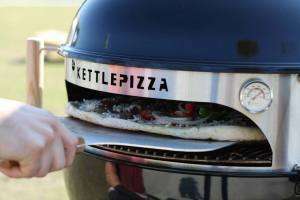 With this KettlePizza kit you can turn your kettle grill into a full outdoor pizzas oven. This particular brand kettle pizza kit can be adjusted to 2 sizes and will fit most standard 22 inch Weber kettle grills and other brands grills. The small is the 18.5 inch diameter and the larger one is 22.5 inches ind diameter. View Larger You place the stainless steel sleeve in between the bottom and lid of your kettle grill and in this way it form a cooking chamber. Then with the pizza pan or optional pizza stone placed on the grate you can cook a Pizza in you kettle grill. The lid stays closed to keep the temperature controlled, because the sleeve has a opening in the front. They say a picture paints a thousand words so that is why we included the picture on the left. Click on it enlarge for a better view. These KettlePizza kits all get good comments on several sites. The only thing that keeps coming back is the little high price tag. This is understandable, but it is made in America and not in China what most people always complain about. The stainless steel ring is the basics of any pizza oven. Diy or ready bought. At first I was confused between the size of the basic set. Looked like it was only for the 22.5 inch kettle grill, but after digging deeper and going to the manufacturer website it is the adjustable version and that comes included in all three of the kits. 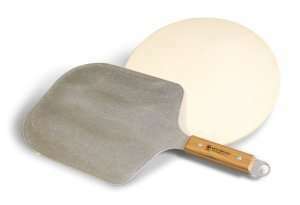 The Cordierite pizza stone that comes in the DeLuxe and DeLuxe USA version is mentioned as a high quality and is one inch thick and this is thicker than most other pizza stones. I have not read anything about the stone cracking because of the temperature. For someone who wants to be ready in one buy, we suggest the DeLuxe or DeLuxe USA. 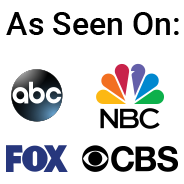 the only difference between these two is the Pizza Peel. Wooden for the DeLuxe and Aluminum for the DeLuxe USA. 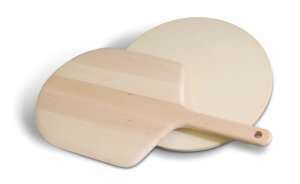 If you feel like choosing your own pizza stone and pizza peel you can start with the basis kit, and have a look at our Pizza Stone Reviews to see what you prefer. There is a little learning curve like with anything else. To find the right amount of charcoal and wood to reach the right temperature. As you can read in this article how to start a charcoal grill without lighter fluid we recommend the use of a chimney starter for your charcoal. The pizzas that are cooked on this KettlePizza kit and the taste that you get all depends on what kind of wood you use of course. Overall if you feel you can justify the price for a Made in America KettlePizza we can recommend the KettlePizza Kits as a good buy. Use flour or even a circle of parchment paper on Pizza stone to prevent sticking. 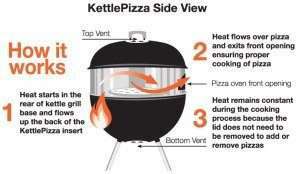 Close the top vent on you Kettle grill to let all air go over the Pizza. Some people like to go all the way and opt for an outdoor pizza oven. If that is you I suggest that you have a look at my Uuni pizza oven reviews to see if that is what you need. Feel free to leave a comment or share your experience about the KettlePizza kits.